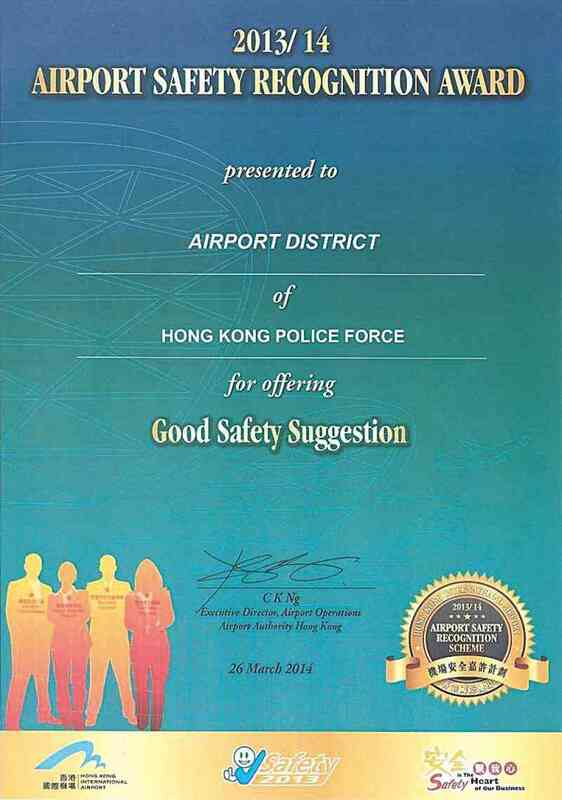 Airport District (APTDIST) has won another award presented by the Airport Authority Hong Kong (AAHK). At the Airport Safety Recognition Award Presentation Ceremony 2013/14 held on March 26, District Commander Kwok Pak-chung received the Good Safety Suggestion Award, on top of the Corporate Safety Performance Award presented last year. APTDIST attaches great importance to staff awareness of occupational safety and health (OSH) issues with emphasis on the common OSH risks at the workplace. With the "Hazard Inspection" procedure, not only does APTDIST effectively provide its staff with a safe working environment, but also strives to enhance their safety awareness. Presenting the awards to the airport community and the award-winning safety role models, AAHK Chief Executive Officer, Mr Stanley Hui, hoped the airport community would continue to promote OSH awareness and achieve higher safety standards.